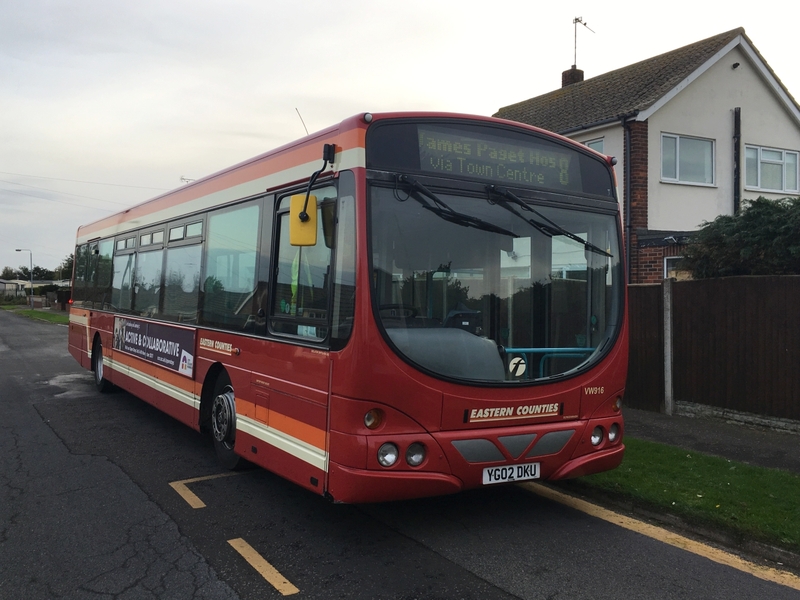 Following on from yesterdays post regarding the arrival of Heritage liveried 60916 at Caister Road from Norwich, it has been noted this afternoon in use on service 8 in the town and was duly photographed at the Marram Drive Terminus in Caister. Thanks to Will Drake for the photograph. Some news of recent arrivals at First Great Yarmouth. Driver Roger Bellward reports the arrival of celebrity YG02DKU. The recently repainted Volvo B7L 60916 gained the old Eastern Counties Post Office Red livery following a visit to Simon Morris of Ipswich during July this year. The reason for it's appearance at Caister Road is that it is due to undergo an MOT. Today (hopefully!) was the last day of rail replacement activities at Great Yarmouth station and I looked in to see what had been achieved on the railway in addition to view the coaches provided for alternative transport for the Great Yarmouth to Norwich line. As stated in press reports, the line on platform 1 was to be removed, as part of the re-signalling scheme, but what wasn't mentioned was the tearing up of the siding next to platform 4. Both had taken place during the week's shut down. With the Festive Season nearly upon us, extra vehicles have been drafted in for an increase in Bernard Matthews contract work. Reported elsewhere yesterday was the arrival of three Dennis Trident/Plaxton Presidents from First South West. Some may not know that this is not the first time all three have appeared with FEC. The three began life with First London before being converted to single door and gaining Barbie livery then passing to FEC in early 2009. 32801/32809 & 32849 worked in the city before moving over to First Essex and then down South to Weymouth & Southampton. All three are now being prepared for use at Roundtree Way. 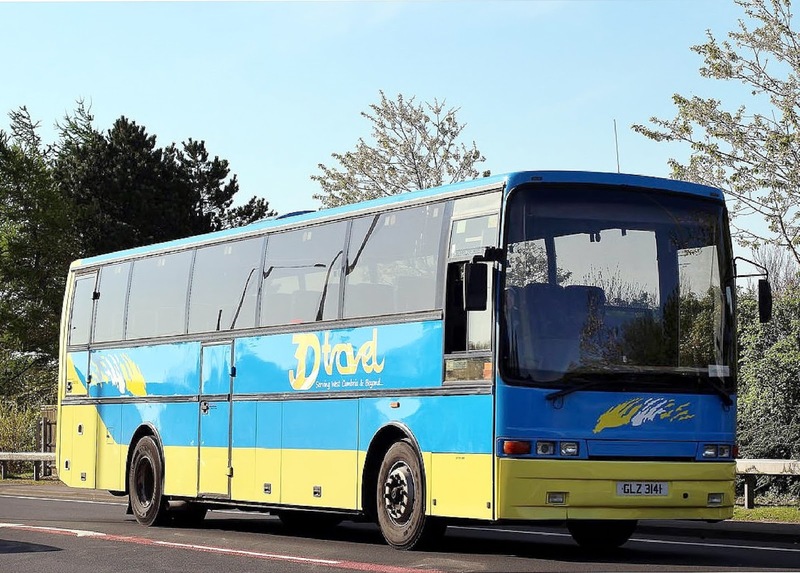 Other news to report is that Coach 20514 is due back at Yarmouth from its loan at Norwich whilst Volvo B7L 66343 (MV02VCW) is going on loan to Caister Road from Norwich. Passing Great Yarmouth station this morning it was a bit of a Simonds fest with three of the available coaches being supplied by the Diss based operator for today's rail replacement duties. VanHool bodied Volvo B12Bs 8333UR and 98TNO provided the horses for the 11:17 departure to Norwich. Whilst standing in the wings was another Simonds VanHool in the form of 224ENG and Smith's Coaches' Jonckheere Mistral bodied Volvo B10M FP51EUN. 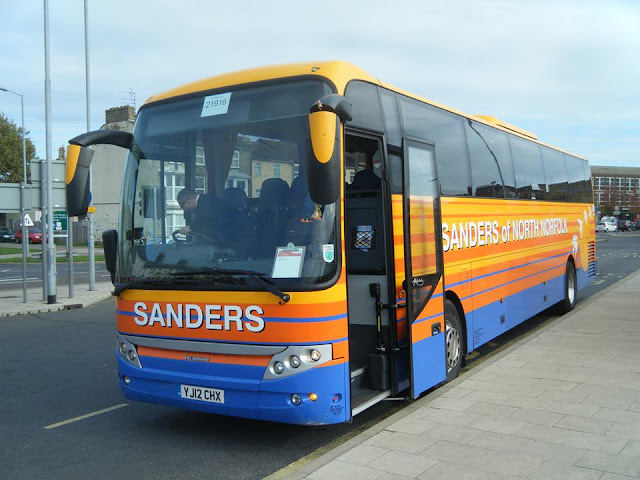 Over at Lowestoft yesterday, Simon Bartram reports yesterday's appearance of Sanders Coaches' Jonckheere bodied Volvo B12BT OGR647 (pictured) and VanHool bodied DAF 537FN with Simonds VRY841 on rail replacement workings. 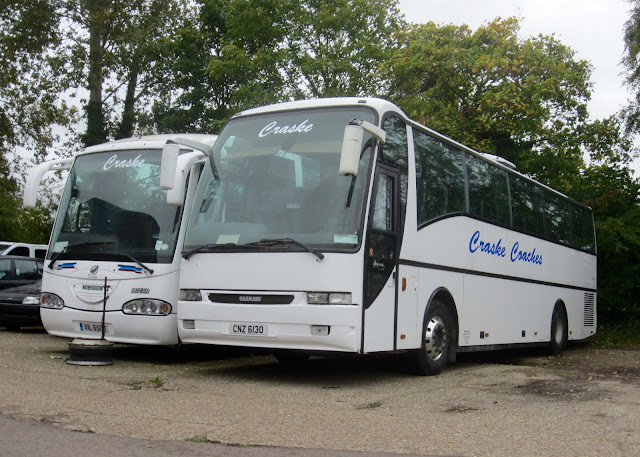 Angie's Tours' BX59KWR and a Belle Coaches Setra were also on standby. My thanks to Simon for his latest report and photos. It is seen here towards the end of its working life at Nelson Road North in Great Yarmouth. The date was 28th June 2007 and it was being employed on Bernard Matthews contract work. I am not aware of its withdrawal date but I suspect it is still at Ambassador Travel's site at Gapton Hall Industrial Estate. 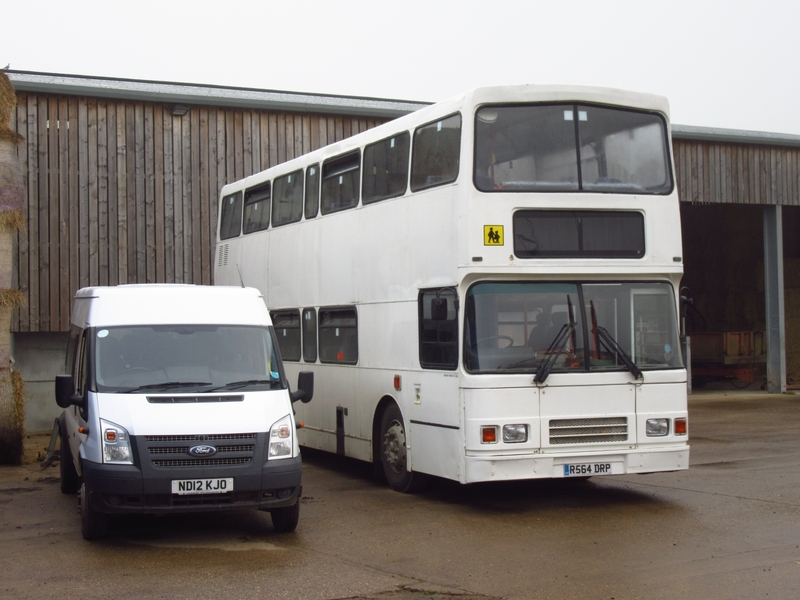 A couple of items to report with the first being an update to the Anglianbus fleet as amended on the operator's website yesterday. 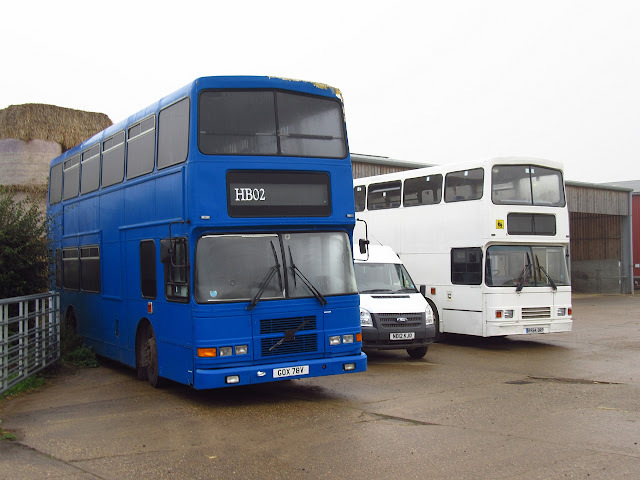 Whilst there are no changes to the existing fleet, it is noticeable that the stored former Headingham and Konectbus vehicles have gone. Also departing since the last update are the last three Go South Coast Citaros. With maintenance now being concentrated at Dereham, and the Ellough site now cut in half, one wanders what future there is for the Beccles site. The new arrangement, plus the registration of both centres for use by both operators, often leads to Anglian vehicles appearing on Konect routes and vice versa. Just the one change to local bus services to record following the publication of today's Notices & Proceedings Report (N&PR) by Eastern of England Transport Commissioner. Richard Hopkiss and Pamela Hopkiss, trading as Feline Travel, has gained acceptance for a new operating centre for seven vehicles at Unit 2 Horizon Industrial Estate on Sutton Road in Catfield. This means the closure of its former centre at Pinelands at Catfield Industrial Estate in the village. Simon Bartram has sent details of the coaches appearing on rail replacement duties at Lowestoft station yesterday. He also sent photos of the two Sanders coaches working the trips and, at first glance, I thought they were photos of the same coach! The first was of Berkhof Axial bodied VDL SB4000 YJ12CHK and the second was of similar YJ12CHX. I would bet I am probably not the first to confuse the two and I am sure drivers and depot staff have suffered the same fate! Many thanks to Simon for the information and photos. With the upgrade of rail signalling work continuing at Great Yarmouth, local bus and coaches continue to provide replacement services. Lowestoft rail services were similarly affected over the weekend. The latest information can be viewed on the Greater Anglia website here. Meanwhile, at Lowestoft Station Simon Bartram captured even more coaches on standby including Belle Coaches Setra LIL9454 and Scania LIL9455. Simonds and Norse were again involved with the former's Volvo YVF158 and the latter's Dennis Javelin YU05ZJZ. From further afield came New Horizon Travel's YP10VZC and their ex National Holidays Setra NH09LRH. 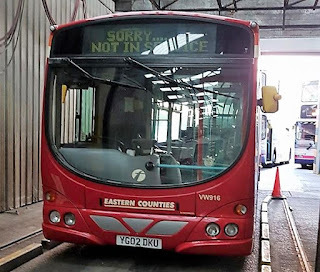 Among the others employed at Lowestoft were First Eastern Counties Volvo B9TL /Wright Eclipse-Gemini AU58ECZ and my thanks to Simon for the use of his photo. Its that time of year when extra workers are required across the regions farms to assist with processing various crops and this means Transport being supplied to move the workforce around safely. G's Growers Ltd run a fleet of Double Deck vehicles from Soham in Cambridgeshire and various vehicles have been noted over the past few weeks at Hirst's Farm in my home village of Ormesby St. Margaret. I visited on Sunday Morning and was greeted by former Dublin Bus Volvo Olympian GOX78V, New in 1999 as 99-D-605 (RV-605) and Ex. Stagecoach Cambridgeshire Olympian R564DRP (16214). It was latterly with Shoreys Travel, Maulden in Bedfordshire. Also on site was Ford Transit ND12KJO. 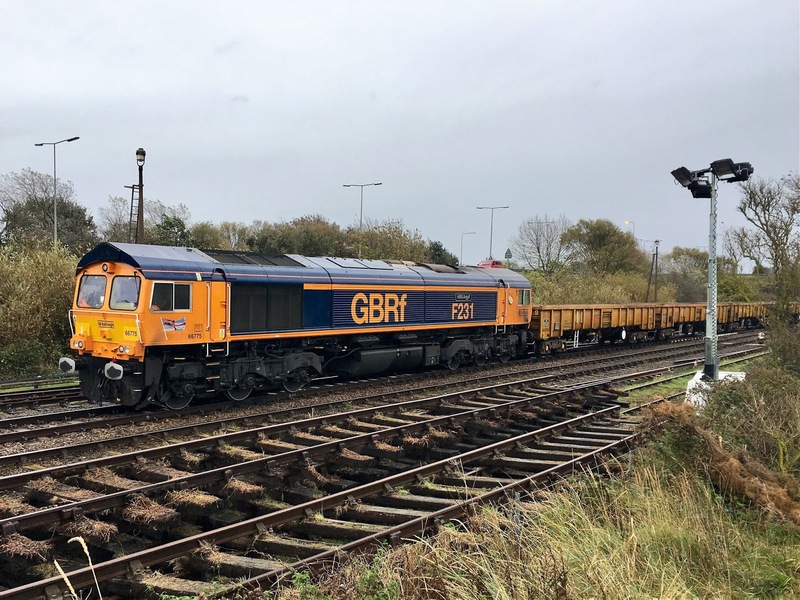 Major project work started today to upgrade signalling equipment on local rail lines with the Great Yarmouth to Norwich route being significantly affected. This means that, from today, no rail services will run between the two stations with buses replacing trains until 29th October inclusive. Accordingly a number of coaches have been, and will continue to be, used instead to provide cover. Among those noted late this afternoon on these duties were Sanders Coaches' VDL/Berkhof YJ12CHK, JR Executive Travel's Setra JR56BUS and Simonds' Volvo/VanHool KDX108. No doubt there will be others appearing during the days of closure. 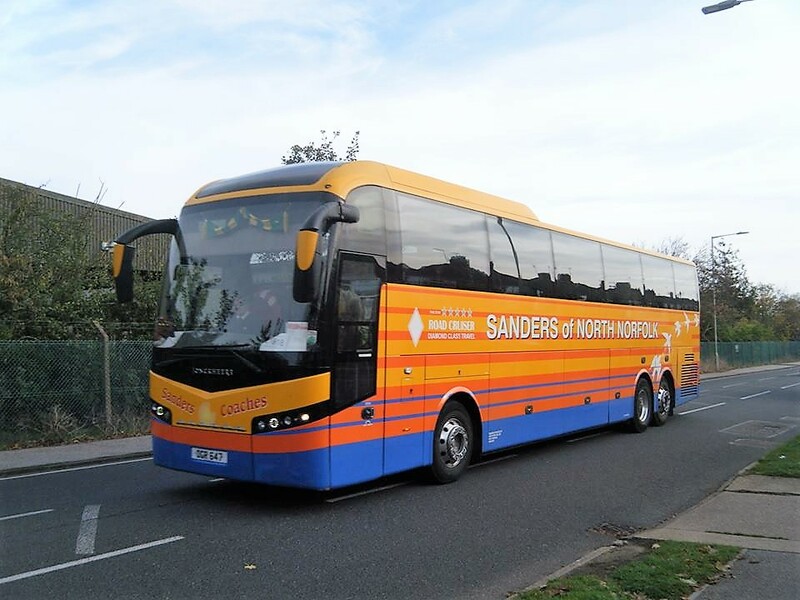 Following the acquisition of a trio of ex Stagecoach London Scania Omnicities, two of the BorderBus Wright Eclipse Geminis have now found a new owner in North Humberside. The November issue of Buses, published yesterday, reported that both H43/27F seated LF52ZPC and LJ03MJU are now with Ellie Rose of Hull. 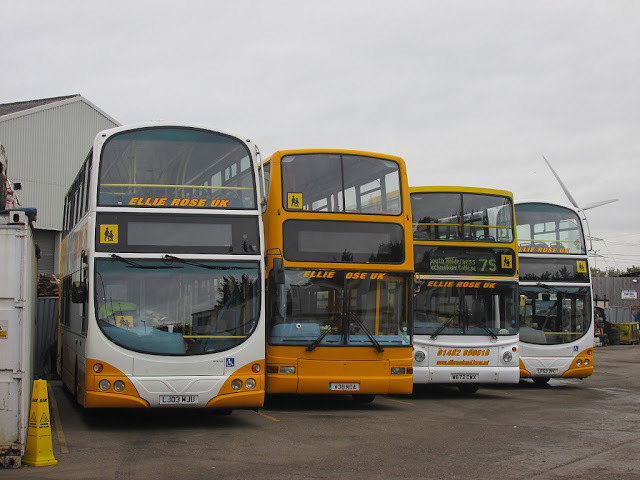 The Suffolk based operator had acquired the twosome during the summer of last year. The former was new to London General in December 2002 whilst the latter began life with Arriva London North in March 2003. I am grateful to Dan Dearing for his consent to use his photo of the two buses with their new owner. Dan has more than 130,000 photos on his dearingbuspix flickr site. 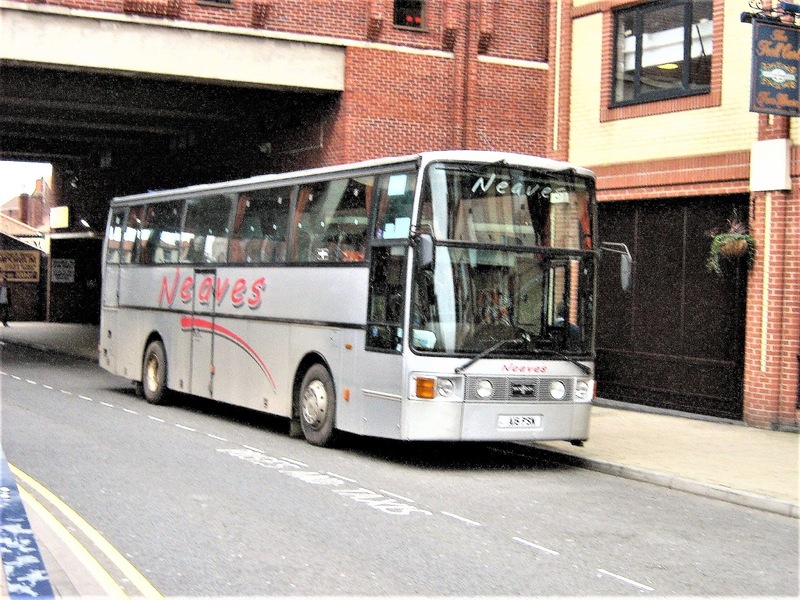 After a week off Throw Back Thursday returns featuring a coach from the now defunct Neaves of Catfield fleet. A16PSN is a Van Hool Alizee bodied DAF SB3000 which was new to Smith of Alcester as G976KJX in May 1990. 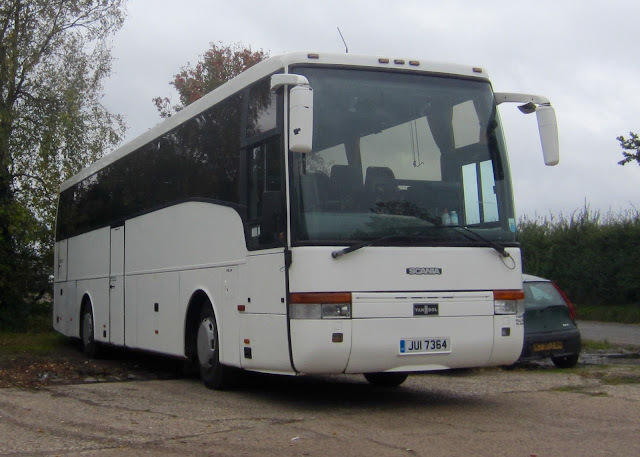 It also saw use with Kings Tours of Colchester in the interim period with Neaves acquiring it in mid 2004. As for Neaves of Catfield, the company was acquired by Sanders Coaches in April 2014 complete with coaches, bus services and staff. 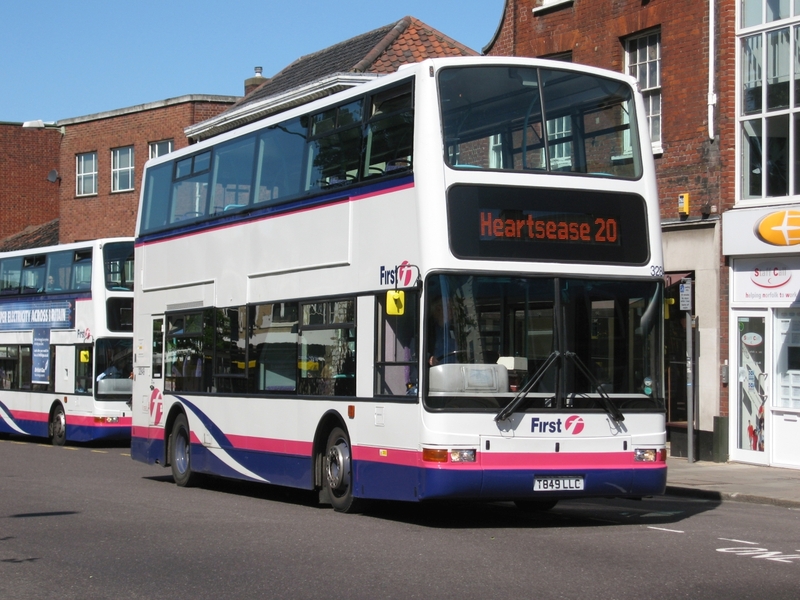 Again there are no changes to local bus services to relate following the publication of today's Notices & Proceedings Report by Eastern of England Transport Commissioner. 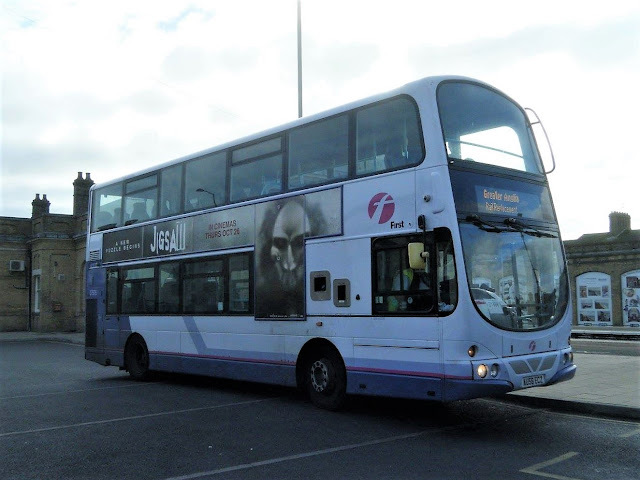 Volvo B7L 66345 MV02VCY recently transferred up to First West Yorkshire from Norwich and is now based at Leeds Bramley Depot. It has been fitted with new destination equipment and is seen here working the 86 service to Rodley. Many Thanks to Matthew Jimmison for use of the photograph. As part of the short break down south we just had to pay a visit to Brighton and so it took place on Thursday 12th October. 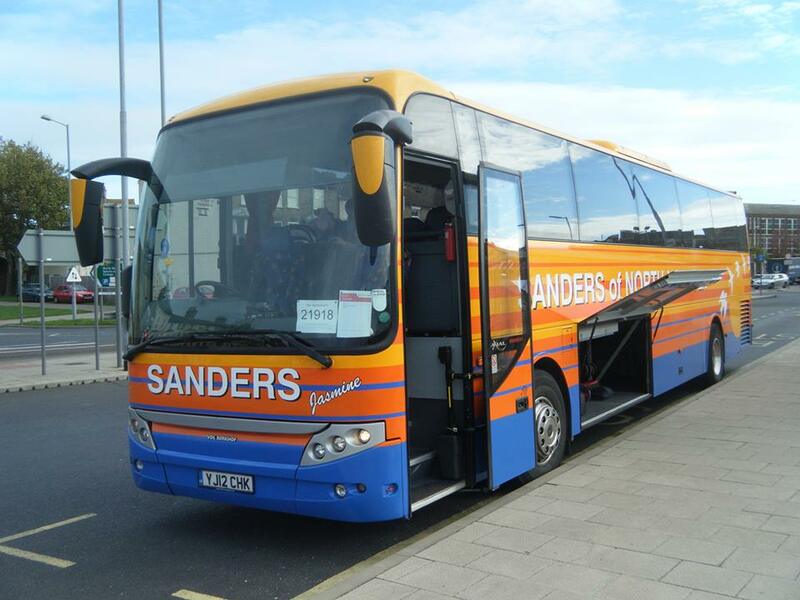 We used the Stagecoach South 700 Coastliner to travel from Worthing to Brighton. On the journey we passed ADL Enviro400 bodied Scania N230UD 15983 (YN64XSK) heading westbound at Shoreham. As it was a warm sunny day, we decided to leave the bus at Grand Avenue in Hove and continue our journey on foot to Brighton Pier; visiting the compact and bijou Pool Valley Coach Station on the way. Only one National Express coach was present and that was Caetano Levante FJ11MJK from West Drayton's Sipson Road depot awaiting its next duty on the 747 route. Arriving at the Pier, Brighton & Hove's OmniDeckka open topper 920 (YN06NYL) was offering a sightseeing tour. Incidentally similar 919 (YN06NYK) was also noted on the route later in the day. With Churchill Square not providing much variety, I decided to concentrate most of my sightings in the Steine Gardens area in the hope of seeing one of the two recently transferred bendybuses from Konectbus - unfortunately I was out of luck! However, I did see Mercedes-Benz 0530G Citaro 107 (BD57WDK) which had lost its normal service 25 branding in favour of a '# Science on Buses' livery. Metrobus also had a presence and pictured is route 270 branded Alexander Dennis Enviro200 6780 (YY15GCZ) at Old Steine. The 270 links East Grinstead to Brighton via Haywards Heath and Burgess Hill. Similarly branded 6781 (YY15GDA) was also observed during my visit. The Big Lemon also serves The Steyne area and early on most of their workings eluded my camera, but I was in the right place at right time for the next photo. It is of the first decker the operator has acquired since an Olympian in its early days. TransBus President bodied Volvo B7TL PJ53NKK is captured in St James's Street and was new to Go-Ahead London. My final photo is that of a Coliseum Coaches 2017 registered Scania YR17RJO. Coliseum is part of the Fareham based Lucketts Group with another representative of the fleet in attendance in the form of Worthing Coaches Scania YN64AGZ. Apologies for the lack of posts over the past few days with the reasons being twofold. Firstly, as highlighted elsewhere, there has been little (or nothing!) to report of late and, secondly, I have spent the last week away on the south coast at Worthing. However, what I can bring you is some photos of sightings in Worthing on Monday 9th October. The first features a Metrobus Scania OmniCity on Marine Parade. 6551 (YN05HCG) is arriving on the hourly 23 service from Crawley. On South Street can be seen Stagecoach South Enviro200 36054 (GX58GLK) which was, at one time, an incumbent of Basingstoke. The other bus operator in the town is Compass Bus which was using similar GX13FSU on its 16 route to West Tarring. 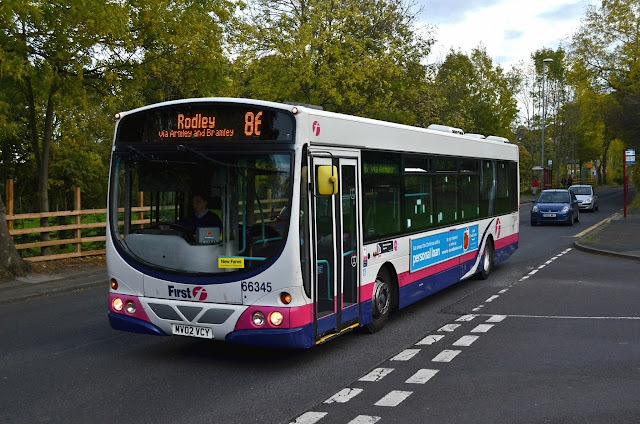 There are no changes to local bus services to report following the publication of today's Notices & Proceedings Report published by Eastern of England Transport Commissioner. The O-licence of 3D Travel, based in Whitehaven, Cumbria, has been revoked by the Traffic Commissioner for the North West, Simon Evans. The revocation takes effect from October 20, 2017. 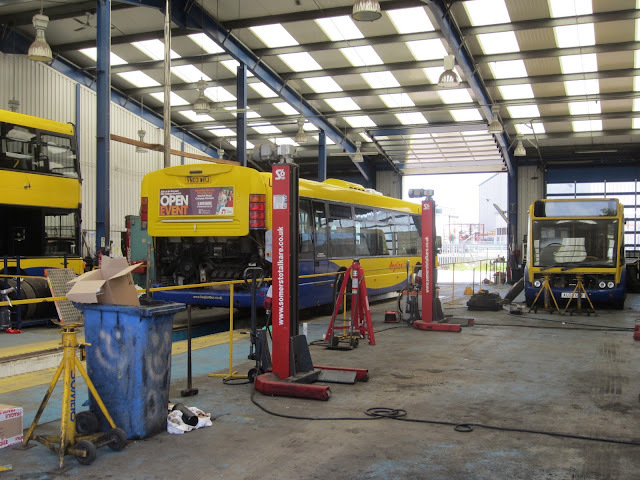 The partnership running the business, Peter Kermeen and Elaine Fletcher, were each disqualified from holding or obtaining an O-licence for nine months, while Peter Kermeen lost his repute as transport manager and was disqualified from this role for two years. This means that the future of former Great Yarmouth Swift Taxis coaches acquired by the company is now uncertain. We will keep an eye on this operator and let you know of any further developments. Heading for the North Norfolk coast on Saturday, I thought I would divert via Catfield to locate the premises occupied by Craske Coaches. 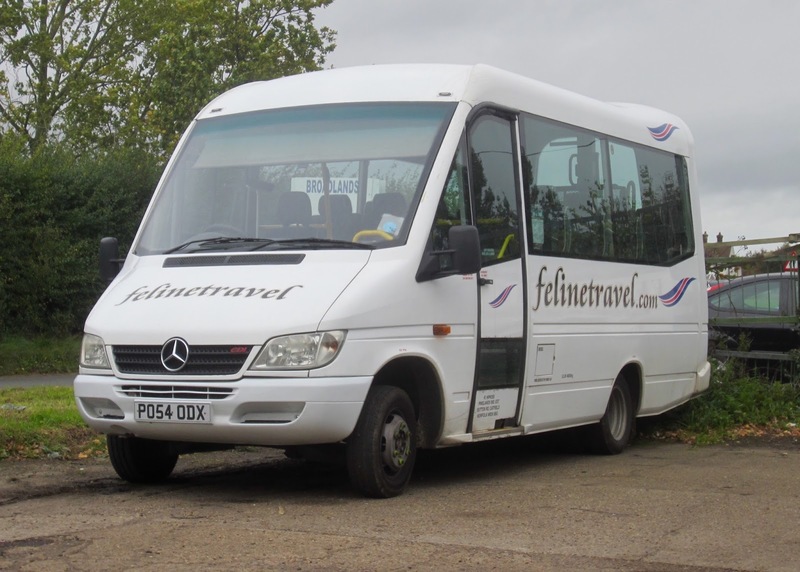 On the adjoining site were three minibuses operated by Feline Travel - Mercedes-Benz Sprinter PO54ODX (pictured), Irisbus ET07FET and another Sprinter in the form of FY03WZR. Former First Essex 42919 (EU05AUL) is seen over the inspection pit at the depot following the application of its new livery at Simon Morris in Ipswich. This means that all four Great Yarmouth examples now wear the new colours - in various forms! As previously mentioned work has started on the first of the First Lowestoft Darts with WX05RVV turning up in Ipswich. My thanks to First Great Yarmouth for supplying the photo. Passing Market Gates during yesterday morning I observed an Excel branded Gemini awaiting in the gloom to work the 11:35 service 8 to Caister's Second Avenue. I waited for it to emerge into the daylight to get a photo of 37578 (AU58EDJ) but unfortunately the destination screen shows up blank! However, if proof was needed, the word 'Caister' shows up on the side destination beside the exit/entrance. Not much to report, activity wise, other than the return from Simon Morris of the last of Yarmouth's ex First Essex Darts to receive the latest First livery. After the arrival of 42919 (EU05AUL) at Caister Road, Lowestoft's 42911 (WX05RVV) made the trip to Ipswich to become the first of their Darts to be similarly treated there. Meanwhile, another of First Great Yarmouth's Darts 42920 (EU05AUM) is on loan at Lowestoft having been noted on the 101 route this morning. Today's subject for our Throw Back Thursday feature is former Anglianbus Volvo Olympian R361DJN wearing fleet number 505. It subsequently moved to Anglian where it was specifically branded for the operator's 588 route between Halesworth and Norwich via Bungay and could later be found on schools services. During 2008 it was acquired (along with Anglian's similar R372DJN) by York Pullman and gained the York operator's Student Link livery. It was also allocated the private plate NJZ9182. In July this year it was noted as being available for sale having reverted back to its original London registration. 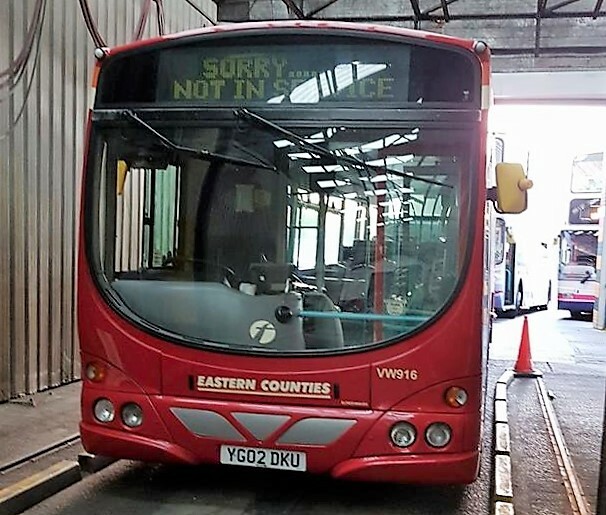 A small number of alterations to local bus services is contained in today's Notices & Proceedings Report published by the East of England Traffic Commissioner. 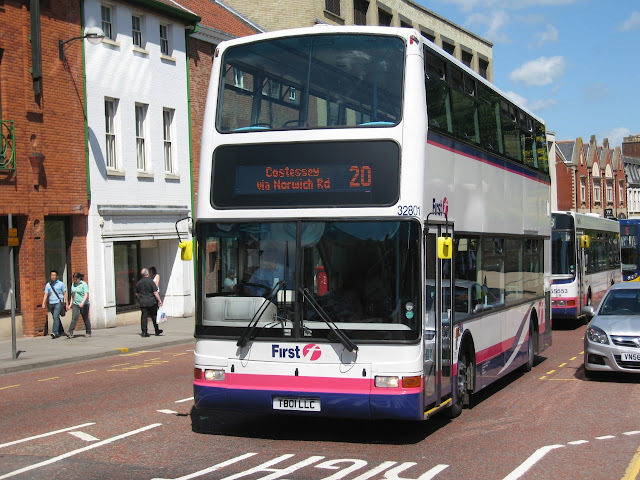 National Express is to amend the route, stopping places and timetable of its 371 service between Great Yarmouth Market Gates and Birmingham Coach Station from 20th November 2017. An application for a new operating licence has been received from Oleg Danaila, trading as R D O Pyramis Limited, for the authorisation of one vehicle at 28-29 Princes Road in Great Yarmouth. With the demotion from service of the last three Go South Coast loaned vehicles and the transfer of an Optare Versa to Konectbus, the Anglianbus fleet now totals just 22. 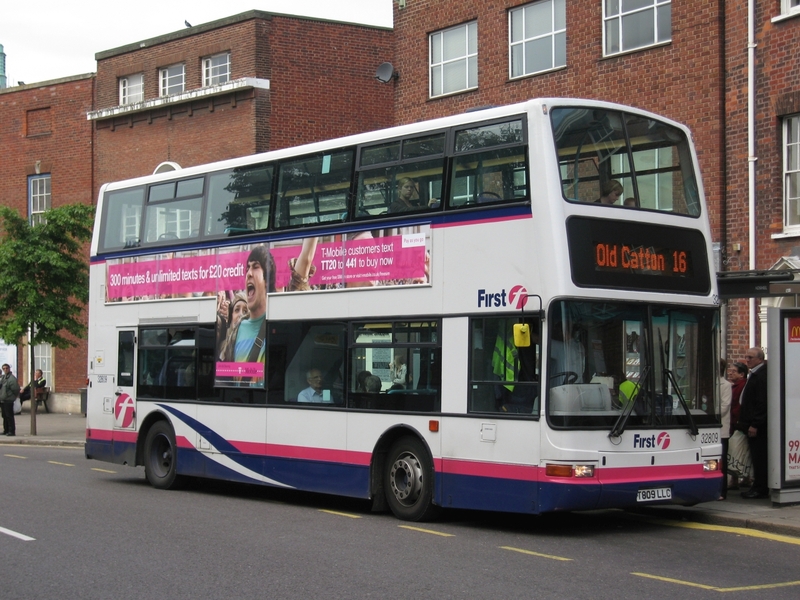 I then renewed my acquaintance with former First Great Yarmouth Volvo B7TL Plaxton President 32201 (LT52WTF). These days it carries First Norwich Purple Line livery and its next journey was the 16:35 service 36 to Horsford. 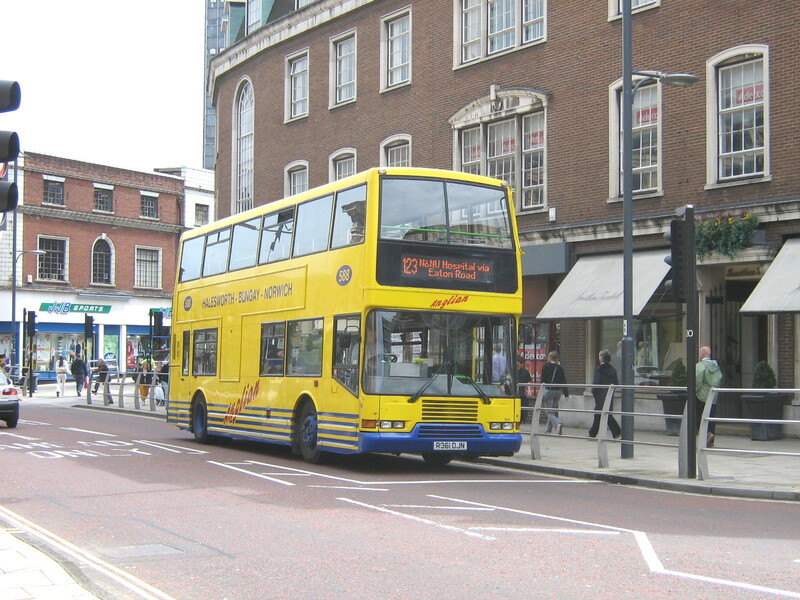 Some photos of interesting independents follow with the first being that of Smiths Coaches Scania D5SOB which is seen on Red Lion Street with a private charter. The final offering is that of Freestones' Volvo B10M / Vanhool Alizee T9BJF on an unidentified Megabus service (?) It is thought to be working a delayed service to London Victoria although Cambridge is noted through the windscreen. Some two hours later I receive the call to say that they had finished shopping - so much for 'popping in' then!